Did you know you can create your own rings? Find out how right here. Why Create Your Own Rings? Of course, there are plenty of beautiful rings on today's market, easily purchased and worn home the same day, but why settle for someone else's designs when you can create your own rings? No, you don't need to be a metal smith or a diamond cutter, but you do need to know what you like and be willing to pay for it. Why put in the extra effort to have a ring built to order? Imagine the thrill of the woman who receives an engagement ring that was custom ordered for her by her groom-to-be. Picture the sparkle of a tear in the eye of a mom who receives a Mother's Day ring that was designed for her by her own children? That's exactly why. There are two main routes you can take to create your own rings; you can work directly with a local jeweler, or you can choose to build your ring by using an online jewelry store's software program. There's a certain advantage to going local because you can actually view the stones up close and get pointers and recommendations from a professional. When buying jewels online, you must rely on the jeweler's grading of the stones, and hope that the image on the screen is an accurate representation of the actual stone you purchase. Either way, the process of creating custom rings in person or online is quite similar. Choosing your gem is the first step in building your own ring, and your selection is crucial to the value of the finished piece. Let's talk about what you need to know using diamonds as our example. First, you'll need to select the shape of your stone. Cutting diamonds requires exceptional skill, and so the cut quality is graded. Comparing diamonds of the same cut and carat weight may reveal significantly different grades of stone. There is always an "Ideal" standard, and some cuts may turn out to be too deep or too shallow, which can affect the way the gem will reflect light. D-F: These stones are considered colorless, and therefore carry the greatest value. G-J: These diamonds are considered nearly colorless, and are still a great choice if budget is a consideration. K-M: Diamonds in this group have a very faint yellow tint that is barely visible to the naked eye. N-R: Stones in the group carry a very light yellow tint that is slightly more visible than in group K-M.
S-Z: Diamonds in this group are visibly yellow, and although they are the least valuable for our discussion purposes, they are still quite wonderful if you like the look of yellow diamonds, and considerably less expensive than clear ones. Diamonds are sorted by weight in units known as carats. Although weight contributes to the actual size of a diamond, it is not the only determining factor, and cut also plays a significant role in the size of the stone. Carat sizes used in rings typically begin at .25 and range up to 5.00 on average. Larger diamonds are rare, too cumbersome to make rings with and pricey beyond belief. Clarity is all about the impurities, or lack of them, in a gemstone. Since genuine diamonds are formed deep in the earth, they are subject to acquiring a number of impurities, including structural flaws and minute specks of natural debris.Obviously, stones with the fewest impurities offer greater clarity, and so are more valuable than their lesser contenders. However, since flaws are so hard to see with the naked eye, clarity tends to be less important than color, cut and carats. As you can see, selecting your stone requires the consideration of many elements, and all must be weighed against the actual cost of the gem. Once you've done the hard work selecting your diamond, you must choose the perfect setting to show off its fire and beauty. Many purists believe the setting should not overshadow the stone, but it's really a matter of personal taste. Your setting might be the classic solitaire, or you may prefer a setting that will hold multiple stones of varying sizes. Obviously the setting you choose will also contribute to the final cost of the ring. A standard gold setting could cost as little as $300.00, depending on the karat, while a top of the line platinum setting might cost upwards of a $1000.00. Of course, sizing is incredibly important, and even more so if you're giving your creation as a gift to someone. 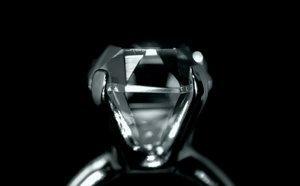 If the ring will not be a surprise, it's best to get a professional fitting at the jewelers for greatest accuracy. If the ring will be a surprise, the sizing can be taken from another ring belonging to the giftee. Either way, rings can be adjusted in size after manufacturing, if need be. Sizing tip: Be sure the ring size is large enough to slide snuggly over the knuckle joint. Once you have chosen your elements, it's time for the jeweler to combine them into the finished piece. If you've done your job well, you'll have created the ring of your dreams.